The Roker Sport was deemed the best bike for adventurers, and named the Subaru Crosstrek of the road-bike world, in Outside's 2016 Buyer's Guide. 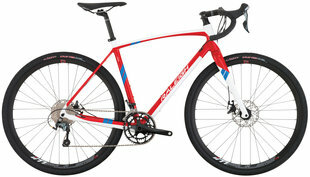 The Roker Sport's design comes from Raleigh's years of experience designing cyclocross bikes, and resulted in a full-carbon road bike that offers a stable, comfortable ride with ample tire clearance. Outside's testers especially appreciated the Clement X'Plor tires that allows cyclists to transfer from pavement to dirt without missing a stroke, and the power of the Roker Sport on flat terrain. Editor's Quote: "a full-carbon roadie that's stable, comfortable, and built with plenty of tire clearance." To view the Roker Sport, click here.